Xiaomi announced it’s latest flagship Phones named Mi Note and Mi Note Pro. 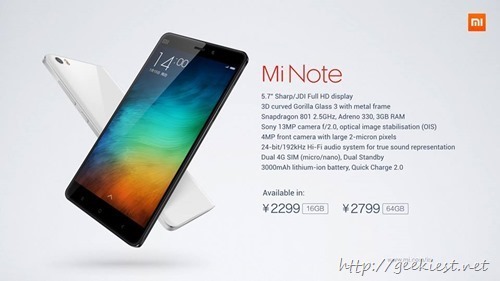 Mi note is a Dual 4G SIM phone, which will have 5.7 inch Full HD display, Curved Gorilla Glass and metal frame. This will be using Snapdragon 801 2.5 Ghz processor and Adreno 330 GPU. Other features are 3 GB RAM, 13MP Sony Camera (primary) and 4 MP front camera, 3000mAh battery. This phone will be available from Second quarter of 2015. The price of the product will be 2299 Yuan ($372) for the 16Gb version and 2799 Yuan ($452) for the 64GB variant. 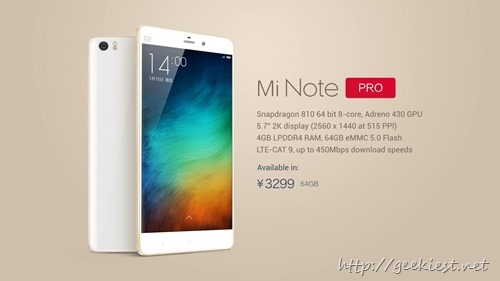 Mi Note PRO features includes Snapdragon 810 64 bit 8 Core processor, Adreno 430 GPU. One of the main attraction will be the display. The display is a 2K 5.7 inch one with 2560x1440 resolution with 515 Pixel Per inch. It also have 4GB LPDDR4 RAM, 64GB eMMC , LTE –CAT 9 support. Other features such as Camera , Battery are expected to be the same as MI Note. Price will be 3299 Yuan approximately $533. Xiaomi 's new flagship phones will be Mi Note and Mi Note PRO.